Get ready to roll around in style with your new Magic Cars® big seater remote control electric Mercedes G55 Wagon for kids as seen on Nickelodeon, Animal Planet, Lifetime, and Hallmark TV. Now with dual 12 volt motors, real rubber tires, 2 real working Mercedes metal ignition keys, Mercedes keychain, Mercedes AMG factory floor mat, and a leather seat! Yes, your child can really ride inside this Mercedes car. Great for ages 1-5. Perhaps you drive a full size AMG Mercedes Benz wagon so you know that this truck is perfect for children and everyday use. Magic Cars® are the best ride on cars. It's like owning 2 cars in 1 as you can allow children to drive the electric car themselves from inside the car with the steering wheel, pedals, and buttons. Or control your new Mercedes SUV truck via the included wireless Magic Cars® steering wheel to operate in Mom/Dad mode. Don't be fooled by imitators, only official Magic Cars® sold on TrendTimes.com come with the "Best In Class" 1 year bumper to bumper warranty for free. Watch the video below of the Magic Cars® AMG Mercedes truck traveling along the hand painted yellow brick road to TrendTimes.com! New and improved with bluetooth remote control! Buy from TrendTimes.com, your #1 Mercedes toy experts. Plus, you can tell your child, "Hey, be nice, I bought you a Mercedes G Wagon for your first car". Now parents can press the "STOP" button on the remote control which stops the car from driving. The speed level is now ON the remote itself, so parents control the speed (3 speed options) at will. Comes with seat belt, mp3/iPhone input, working stereo with volume control, car sounds, working lights, and 2 metal Mercedes ignition keys for added realism. Your child or loved one can drive forward, backward, left, and right. The coolest part of this Magic Cars® Mercedes G55 ride on car is that parents get a fully functional wireless Bluetooth remote control to take over control and direction of the car. Maybe, you have a young driver that cannot reach the pedals? Or you just want to have fun driving the car with your child inside it. Either way, this ride on car is amazing and the solution to all of your problems. Ride inside the house or outside in style. The included powerful 12 volt motor and 12 volt battery will have you riding for years. Reach speeds of about 5 mph. Plus you can choose the gears for fast and slow. Want to let your child control the car instead? No problem, flip the switch in the car and the young driver gets full control. Watch the official Trend Times Magic Cars® remote control ride on RC car commercial below and enjoy what is so amazing today. Buy this car and you will feel like the entire family just bought a full size Mercedes Wagon to enjoy. Yes, your Mercedes G Wagon comes with a full Magic Cars® 1 year warranty and is extremely durable and high quality for years of playtime. We are so pleased with the service we received! We have a very happy 3 year old that loves to drive and sing to the songs!! We are so pleased we purchased through Trend Times. We will do the same for the next grandchild! Thank you for all of your help. Truck is great! She is making a grand entrance at her first birthday party. You guys did an amazing job. Very satisfied!!! Hi Trend Times, we received the car yesterday and it works wonderfully & Elyse is loving it! We could not be happier with the car! Looking forward to finishing it off with the two license plates! Thanks again for all the assistance. I would like to thank you guys for this wonderful car. She loves it. It was the best gift she ever received. Very helpful and I am very happy customer and so is my daughter. my son's absolute favorite toy in the world!! It is my son's absolute favorite toy in the world!! He rides in it at least an hour every day!! These guys came through clutch !!! My son loves his G wagon, his birthday was perfect thank you trend times you guys Rock!!! So far we have no complaints. It has been so much fun playing with our Granddaughter. She loves her new Jeep. My husband put it together and it runs fine. The remote works great. Thanks for lots of memories. I must say this is one smooth ride that stops the block every time my daughter drives her red Benz down the street with the stereo playing. My son loves this!! He is 5 years old with spastic quad cerebral palsy, and we have been searching for something we can control with a remote for him for a long time! He loves the mobility as he can't move on his own.. this really gives him that feeling of independence! Thank you again so much for this amazing product you've created, that really allows a little boy to actually be included in something mobile with his neighborhood friends for once!!! I wanted to reach out to you to let you know that my son, absolutely LOVES his Magic Car!!! My husband and I are so happy we found TrendTimes - you guys are awesome! My son loves his new ride. Shipping time is phenomenal. Only took about a week. Email response is speedy. Most people struggle with the assembly part of ride on cars. But with this Magic Cars Mercedes G55, I really want to say, it is easy and pretty much common sense as all of the major stuff is put together. The box is huge! I just read the instructions once, put the wheels on, charged the battery for 8 hours, and was on the road. The car still looks new and works absolutely fine even after 9 months, wow! It truly is great playtime fun for our whole family. Lovin it! I would definitely recommend this Magic Car. This G55 Mercedes Wagon drives great and runs smooth over our street and grass. The best part is the parental control wireless remote that has a far range. I can immediately press the STOP button when he drives away too far. It also comes with a lot of entertainment features, like working stereo, lights, ignition keys, etc. My son is loving his birthday present, and were more than glad about it! What a car for my child! Our 21-month old daughter loves her new toy like anything. We let her drive on her own indoors but always keep control in our hands when driving outdoors. Thanks for this dual control mechanism. She loves the engine noise and enjoys the functional lights and stereo sounds as well. Great ride on car for my 4-year old. The Magic remote control mode makes it perfect. I can control everything with my fingers when I want. Even control the speed levels it will run on. Awesome stereo and volume control is extra cool. Thumbs up! Solidly built, safe, and perfect size This Mercedes remote control wagon is a great toy for my toddler. It looks exactly the same as in pictures. I control the drive as he enjoys the funky music it plays. I am sure hell learn to drive it himself soon, and enjoy it even more! 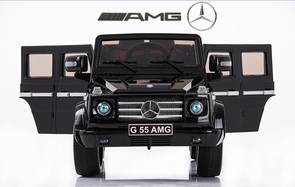 I adore the Mercedes G55 car myself and my kids love this electric toy car version more. The real rubber tires run smooth on all surfaces. The remote control featuresworks well and is easy to handle. The interior and accessories provided, like the keychain and floor mat are really cool. Overall, very impressive! Absolutely amazing! I thought it would be cool ya know? But when we got the car and my son got in it. His eyes light right up and I could see this was more than cool! I guess, you could say it is the same feeling of amazement you get when going to an amusement park. I would recommend this Magic Car. Very good service just like my real Mercedes dealer!